I love the "codetta" that Peter Kivy puts at the end of his "Opera talk: A philosophical 'phantasie'" chapter in The Fine Art of Repetition. Strange creatures these operatic people, worthy of the wildest of science fiction imaginations. What bizarre transformations they have undergone to have become able to speak in song and move as disembodied orchestral sound. O brave new world that has such people in it. How remote they are from us and our prosaic and bodily lives. And what is the Countess to me that I should weep for her? Is it enough to say that we have both acquired the art of expression, but that she has got a little ahead of me? "Little" is hardly the word for it. She has Mozart's powers, and I only my own. Yet there must be common ground. Or so at least I assure myself, somewhat doubiously, each time I go to the opera to believe the impossible. Kivy writes about operatic characters as being composers of their own music, and here he refers, by the way, to these "fantasy" composers as being both women and men. Or maybe I should call this "Authenticity and Innocences"
I have been reading an excellent book of essays by the philosopher Peter Kivy called The Fine Art of Repetition: Essays in the Philosophy of Music that is, fortunately browsable by way of Google Books. Though I don't agree with everything Kivy says, and there are some glaring "innocences" in the chapter on the concept of "historically accurate" performance, like a reference to the Mozart Clarinet Concerto having been played on the clarinet and only the clarinet (we know now that it was written for the basset clarinet), and his reference to the term Adagio as a tempo marking rather than an indication of character, I really enjoy his writing and the spirit of his arguments. You might notice that Kivy always refers to performing musicians and musicologists as "he or she," but he only refers to composers as "he." Hmm. I guess that is another "innocence." Imagine my surprise when I found this image on this BibliOdyssey post today. Even though my first initial and last name appears at the end, I promise I didn't write it. I don't even know what it means! Can anyone translate it? For the past several days I have been reconstructing a cantata written by someone who died recently. I never knew this person, and I barely know the person who asked me to notate and "flesh out" the melodies that he wrote for his texts. 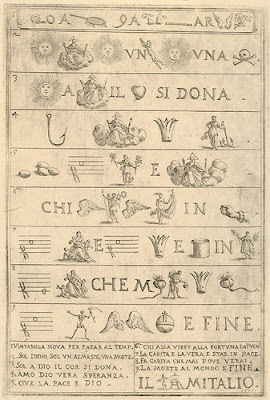 Since the melodies are notated only with letter names of notes (everything is in C major), there is much left to the imagination, but it is surprisingly easy to understand what his musical intentions must have been. The rhythms and harmonies are almost implicit. I don't know if it is from the handwriting, the texts, or the physical way the pages look, but I have been able, without question, to come up with plausible musical material. It reminds me of the first project of this sort that I ever took on. One of the perks of being a violist in a rather rural area is that it is relatively easy to find people to play chamber music with. At least it was for me when I started playing. I was so grateful to my chamber music partners for keeping musical company with me, a rank beginner, that I started making arrangements to kind of earn my keep in the ensemble. The viola seat in a string quartet is kind of like having the "answer key" to a puzzle. You can hear, see, and feel how a composition is put together by looking at it from the inside, from its inner voices. It was rather easy and really quite a bit of fun to make arrangements of pieces to play at weddings and parties, and it gave our quartet a certain caché to have our own unique arrangements. I must have made 50 or 60 arrangements before even thinking of myself as possibly becoming a composer and writing music of my own. The turning point for me came when a local business owner named Gene Hoots, who owned a restaurant called the "Burger King" (named before the chain copyrighted the name) asked one member of my quartet if he could make arrangements of some of his songs for our string quartet. Of course this request was forwarded to me since I was the in-house arranger. The project (for which I was actually paid!) ended up being huge. Gene gave me a whole case of cassette tapes of him playing the piano and singing his country songs, along with piano pieces that he thought of as being "classical." I painstakingly notated the ones that I thought had some musical value, and I arranged them for quartet. After working for a while on these pieces, I realized that there was often a lot of "me" in the arrangements, and I realized that, whether I liked it or not, I had a "voice" as a composer. After completing the project I began writing some music of my own. It was then that I decided it was a good time to learn something about composition. I was very lucky to find an excellent teacher who was able to teach me what I need to learn, while incorporating what I had already taught myself through my experience as a performing and arranging musician. Our quartet ended up recording the songs, and Gene put them on the jukebox (yes, there is still one) in his restaurant. He also sold the CDs at the counter. I imagine that there are several hundred copies (I think that he made a thousand of them) sitting around in pick-up trucks around the state. We also performed them a few times, sometimes with Gene at the piano. I guess the recording never made Gene famous as a composer, but it certainly made him and his friends and customers happy. Alex Klein and Blair Tindall (thanks Martha). I'm on Blair's side, by the way. I'm very excited today to head up to Downers Grove, a western suburb of Chicago, to hear a contrabassoon recital played by Susan Nigro this evening. She will be playing a program that includes the two pieces I wrote for her: More Greek Myths and the Harlequin Sonata with pianist Mark Lindeblad. The concert is at The Chicago Piano Superstore (click on today's date when you get there), starts at 5:15, and is free, but you should RSVP to reserve a seat. Composer Alex Shapiro has wise words of advice for all musicians. I felt like the luckiest person in the world while playing my concert on Monday night because I finally felt like I could express myself musically on the violin. It has taken years, and my path has been filled with twists and turns, many instruments, and several dead ends (I played violin from 7 to 11 and then took it up seriously at the age of 31). As a violinist I am an amateur in the purest sense of the word. I play viola professionally (for money), write music professionally, teach professionally, and write reviews and program notes professionally, but I play the violin for myself. I have nothing to "prove" as a violinist, which is what makes the whole process of playing and practicing so fulfilling. I don't think that I will ever be able to play like the great violinists--both alive and dead--that I admire (or even as well as the ones I don't admire), but it really doesn't matter because now that I have enough technique to actually express myself on the violin, getting close to the essence of the music I play is enough. And there's a lot more to learn. I practice the violin because I love to practice the violin, and I play violin recitals twice a year because I love to really work on repertoire with my pianist friend John David, who plays music for pretty much the same reasons that I play music. I wasn't nervous on Monday night. I was excited to share the "stuff" that John David and I love about the music we were playing with the audience, and I'm looking forward to the next time we get a chance to do it. 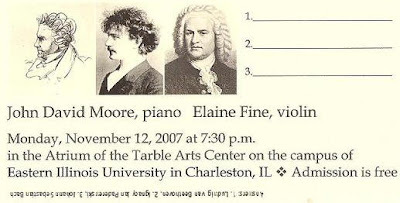 It looks like the main "dish" of the next concert will be a sonata by York Bowen. 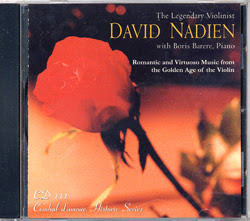 I should be thinking about other things, but since listening to this recording of violin chestnuts played by violinist David Nadien and pianist Boris Barere, all I can really think about is how absolutely beautifully this man plays the violin. You can listen to some sound clips and then you will understand. A wordless setting of Amy Lowell's "Lilacs"
Here is a performance of Lilacs for flute, clarinet, cello, and piano that I wrote a few years ago, as performed last April by the Arcadia Chamber Players. 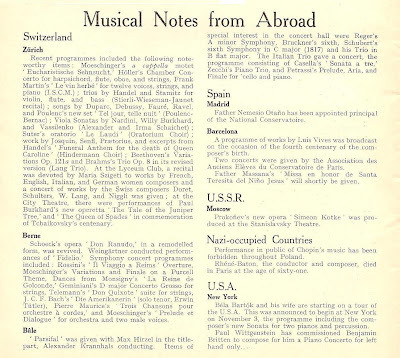 In addition to the item that Michael posted from the November 1940 Musical Times, I thought I'd share this set of "Musical Notes from Abroad." The notice about Chopin's music being banned in Poland is what caught my eye first. Going back in the musical time machine we get to read a notice about Bartok starting his US tour, Wittgenstein's commission for a Left Hand Concerto from Britten, a concert in Zurich of music by French, Italian, English, and German women, a performance of a new set of Poulenc songs, and lots of "early" music in Berne. "Haydn makes you think that what goes up must come down, but then shows you that what goes up may turn left." These examples are here for the benefit of string players who have never been exposed to the two best long tone warm up exercises from the world of flute playing. They kind of serve as exercises and meditations. I love to get completely lost in the complicated acts involved in sound production and really clear intonation, and forget about what notes I am playing or where I am on the fiddle. On the flute I used to practice these at 60 to the quarter note. I like to practice them without a metronome (it distracts from the meditative experience) but I like to stay strictly in rhythm, filling out every note as completely as possible. Spending quality time in the high register of the violin is kind of like re-connecting with what I always wanted to do as a flutist: make the flute sound like a violin. Now I'm trying to make the upper register of the violin feel and even sound like the upper register of the flute! A few weeks ago, when Tim Fain played his Kevin Puts encore, I noticed that when he played all alone in the upper register I could hear a huge amount of air in addition to the pitches he was playing. His fiddle is probably the best fiddle I have heard played all alone in a hall with acoustics like the hall in the Krannert Center's "Great Hall," and he is probably one of the best violinists I have had the pleasure of hearing sustained in the high register, all alone. Since I am preparing to play a violin recital that happens to have many sustained notes up in the ledger-line register, I decided to switch into flute mode when I was practicing today. When you play high in the flute register, the air is part of the sound. It is, after all, what you use to make the sound. It was only today that I realized that when I play the violin in the highest register, and I listen for the air in the sound, the sound is far richer and better in tune that it is if I don't listen for the presence of air in the sound. 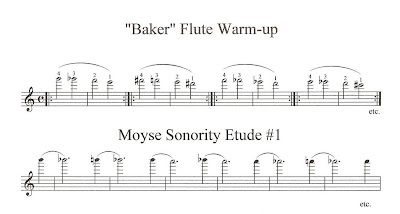 So I played long tones today, and I used the Moyse Sonority Etude #1, which was my first warm-up of the day for all the years that I practiced the flute. Rather than starting on B above the staff and going downward to C chromatically, I started with high B, and made my way down to open G, listening all the while for air. I was able to keep the air going for a long time, even onto the G string. It was really fun, and after practicing this exercise I even felt a little bit lightheaded. I guess I was doing the kind of breathing that I do when playing the flute, which proves another point: how you breathe affects the way you play. I tried it on the viola, but I couldn't hear any air in the upper register. The brightness and body of the sound must cover it all up. Maybe this is one reason that it is difficult to play both violin and viola well: you have to listen for different things in the sound and adjust your physical equipment accordingly.